Much like on our laptops and cloud servers, there are some valuable physical objects we'd like to back up. (Think fine art.) Is 3D printing the answer? — Casino magnate Steve Wynn, discussing his feeling about damaging "Le Rêve," the 1932 painting of Picasso's mistress, Marie-Thérèse Walter. Wynn, who purchased the painting for $48.4 million in 1997, damaged the painting while he was showing it off to friends, and got a little too bold with his gesture-making. (He had retinitis pigmentosa, so his vision was shot, to be fair.) Wynn was about to sell the painting to another art collector, Steven Cohen, for $139 million, but the damage put the deal off, requiring painstaking repairs to the painting that cut its valuation to $85 million. Eventually, wounds heal: Years after the repair, Cohen bought the painting for $155 million. The flag for which the Star-Spangled Banner is written—a massive 42'x30' flag that survived a key battle in the War of 1812—famously sits in the Smithsonian's the National Museum of American History. But nearly half of the flag is gone. You can blame Georgiana Armistead for that. Georgiana, the daughter of Col. George Armistead (the man who saved the flag as a keepsake), started snipping off pieces of the flag at the request of war heroes and political figures, who wanted their own piece of history. By the time the flag went to the Smithsonian, more than 200 square feet had been cut off. If only someone had given Georgiana a backup flag to rip apart and turn into trinkets. It's not always clear whether something is an antique or a just a piece of junk, but occasionally, stories surface of antiques getting damaged by people who don't know any better—then learning later that they probably shouldn't have done that. One such story surfaced back in November, when a French vase created by artist Emile Galle in 1900 was auctioned off for nearly $69,000. However, it would have gone for four times as much, had the owners of the vase not broken it in a childhood game 40 years earlier. Early television shows, somewhat infamously, weren't saved for posterity, despite the fact that many of these shows have immense value as cultural artifacts, and later had great value as things you could watch on Netflix while you were attempting to chill. The most famous example of this is Super Bowl I, recordings of which only exist in piecemeal form, painstakingly put back together by the National Football League. Sometimes though, something gets destroyed by a jerk for no good reason other than to reinforce their jerk status. 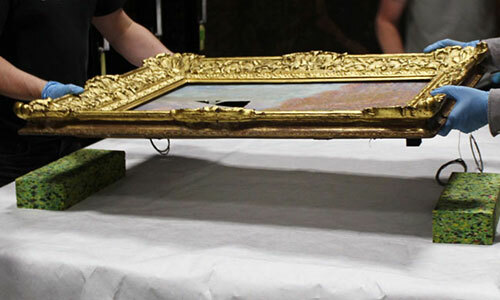 That's the story behind Andrew Shannon, an Irish man who punched his fist through a valuable Monet painting in 2012. His reason? He played it off later, but his reason for destroying the $12 million painting was apparent disdain for the state. Fortunately, the painting was repaired by the museum and went back up in 2014. "There is no question that the Roadshow is littered with the sound of breaking porcelain. The way things get broken is when people don't know how to handle things and on the whole, the experts don't need to break things because the general public do so well without our help." — Hilary Kay, a television personality closely associated with the BBC version of the long-running Antiques Roadshow, discussing the fact that occasionally, really expensive artifacts get destroyed on the show. In a five-period between 2004 and 2009, the show had to pay out more than $8,000 to pay for repairs to products that the show's staff damaged during production. Does the future of fine art involve 3D-printed replicas? The next time some jackass puts his fist through a priceless painting to prove his libertarian cred, could a 3D printer save the day? Chances are, it could. Part of the reason for this is that 3D printers and 3D scanners are in a position to capture the texture of the canvas art, and recreate it almost perfectly, in a way that a simple printer on its own never could. The concept got its start thanks to work by Fujifilm on its technology called Reliefography. In 2013, the company created version of a number of Vincent Van Gogh's paintings by using a high-quality 3D scanner to pick up the details of the art, including the exact texture of the paint on the canvas, then reprinting the art using a 3D printer. The quality of the final result, called a Relievo, is impressive, if not inexpensive—each replica costs $34,000, certainly not cheap enough to put in your bathroom, but definitely nice enough as a way to get a work of art into another museum. The first replications went to Hong Kong, where they were put in a shopping mall rather than a gallery—a place you'd never want to put a Van Gogh otherwise. "Considering current developments regarding the 3D printing process, the creation of a three-dimensional reproduction is an exciting but, most of all, logical new step," Van Gogh Museum Director Axel Rüger said in a statement. "By means of Relievos, availability and accessibility of the works of art can be enhanced, which gives the Van Gogh Museum the opportunity to realize its mission to inspire and enrich as large an audience as possible." Not to be outdone, Canon's Océ arm has also been working on similar technology, and last year the company teamed with the 3D Printing firm Arius Technology and the custom framer Larson-Juhl to launch a new service called Verus Art, which specializes in "re-creations," rather than reproductions, of fine art. And while museums might hold onto the originals, the Verus Art recreations create something tangible of their own: a revenue stream. Maybe in the future, we'll all be able to afford a Picasso—and not just a poster print of that kinda scandalous painting with an easter egg only an artist coloring in the VHS cover of The Little Mermaid could love. The rise of Verus Art and similar products makes one wonder if we're going to eventually reach a point where we create backups of valuable physical things much in the same way we do valuable digital files. That's a weird thing to consider, of course, but clearly the technology is already there and is only going to get better over time. And that, of course, raises the possibility that high-quality replicas could hurt the value of the real thing, especially when the replica, to quote a U2 song, is even better than the real thing. When you think about it, the things that make a genuine artifact valuable are its tangible factors—the things you would never be able to replicate in a copy. The problem is, we're getting closer than ever to being able to replicate those things, and it could create seismic shifts in the way we interpret creativity. As Sean Parker's bank account will tell you, the moment when digital technology was able to replicate intangible objects with bits and bytes was the moment when the rules of creativity were forever shifted, creating new winners and losers. When valuable physical objects can be backed up to the nanometer, does the original object lose its value? Check back in a couple of decades. Then we'll know for sure.